Mo Ahmed, Cam Levins, and Kelly Wiebe in the final metres of the Senior Mens 10 km. Levins (#258) prevailed in the finishing sprint to capture his 3rd consecutive Canadian title. 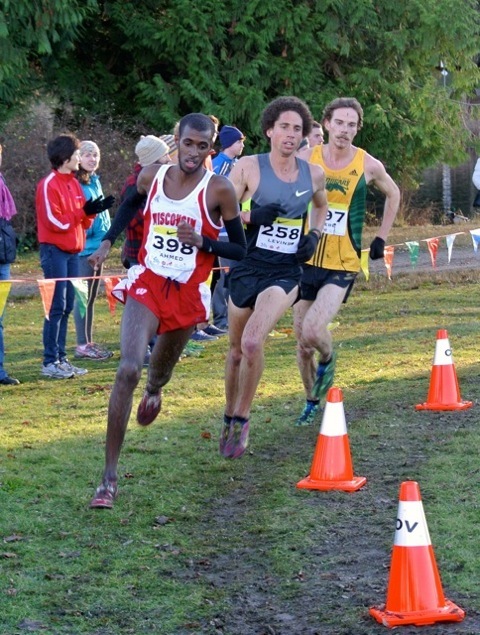 A quintet of Wolves Athletics Club runners contested the Athletics Canada National Cross Country Running Championshipsin Vancouver on Saturday, and all five ran life time best times. In the Junior Mens 8 km race, 18 year old Hayden Hollowell blitzed the 8 km course in 26:56, posting a 77th place finish, improving upon his 2011 placing at Nationals by 35+ places. Teammate Joren Manz took over a minute of his previous best 8 km time and placed 122nd. Jamey Wigmore was the top local athlete in the Junior Womens race, posting a time of 19:21, good for 87th place. Fourteen year old Danae Keddie, racing outside of Alberta for the first time, placed 122nd, one spot better than Kayla Hardy. Other Wolves competitors included Bill and Marlene Corcoran, who placed 63rd and 66th respectively in the Masters 8 km race. Mallory Pinnock, finished 64th in the Community 5 km run. Former Wolves standout Fiona Benson, now running for Trinity Western University, had a strong run, placing 8th (6th amongst Canadians) in the Senior Womens 7 km race. The race served as a selection trial for the 2013 national team, and Benson will now wait to hear if she has been selected for the Canadian team for the NACAC Championships in Jamaica and World Championships in Poland later this winter. This entry was posted in Cross Country, Uncategorized and tagged Alberta, Athletics Canada, Cross Country Running, GPRC, GPRC Wolves Cross Country, Grande Prairie, NACAC Championships, Trinity Western University, Wolves Athletics Club. Bookmark the permalink.